Updated 4/08: stopped here for a meal recently. Overall food quality has dropped significantly. I will go back for more meals and a full review, but for the time being, no longer recommend this restaurant. Many years ago on a whim, I took off on an adventure with a friend, and went to stay in a small stone house on the outskirts of Heraklion, the capital of Crete. A two-week vacation ended up being seven months. During that time we rode up and down the dusty dirty tracks into town on our Vespas, spending afternoons ferrying to other islands, invariably ending up on the patio of a great taverna, watching the sun set and drinking too much wonderful Ouzo. In those days most restaurants didn’t have menus. It was quite confusing the first few times we went, sitting on the patio for long periods while the waiter brought other guests their dinners, but ignored us except for refilling our retsina or ouzo. At that time we had not learned enough Greek to ask for service, but when I got up to use the restroom and ended up in the kitchen, everything became clear. There was a line of customers holding wooden spoons, tasting their way through all the pots in the kitchen. When someone found a dish they wanted, they would nod to the chef and he would immediately serve up a great dish, give it a dollop of olive oil, and send it out the door to the table. The average meal in a good taverna was about $5.00 US. Eleni Touhouliotis was born and raised on the island of Crete. Working in a local Greek restaurant for 20 years, she saved money until she could open the critically acclaimed Elenis Estiatorio in SE Portland. A few years later she opened Eleni’s Philoxenia in the Pearl District. Since returning to the USA, I’ve eaten in many Greek restaurants, but with the exception of one in San Pedro California, I never found any that had food that I would consider Cretian. Then I walked into her door and have been going back ever since. Appetizers run $5.50 to $8.00. Try the wonderful garlicky revithia dip made from garbanzo beans and tahini, with crusty bread. On a warm evening the cooling Greek standard tzatziki made from yogurt, cucumber, garlic, lemon and dill will freshen you up. Skordalia is always a huge hit at my table, made the traditional way with potatoes, walnuts, garlic, and lots of good olive oil. If you are in the mood for a yin/yang type dish, start with Feta Me Filo which is a thick layer of feta cheese over flaky filo dough, doused with Ouzo, and then to offset the cheese, harmonized with a sprinkle of honey. It all works together to keep it from seeming like a dessert. One of my favorite dishes when I lived in Crete was Saganaki, Kefalograviera Greek cheese, pan fried until it has a crispy crust, dramatically flamed at your table, and doused with a squeeze of lemon. If you are in the mood for seafood, I’ve never had better Calamari then Eleni’s Schara Kalamari, grilled quickly, and finished simply with lemon and garlic. It has a wonderful crispy texture that you won’t soon forget. I could easily make a dinner out of a few appetizers, but the entrées always beckon and I end up ordering far more food then I could ever eat. Makaronia Me Kima is a perennial favorite among my friends; Painted Hills ground beef, simmered with vegetable and galic, then spiced with cinnamon, nutmeg, and cloves, over thin pasta. Manitaria Me Skortho is another winner. Wild mushrooms, pancetta, onions, and sage served over orzo pasta has a deep earthy quality. Sometimes I have a craving for something simple and go for Makaronia Me Elies – Spaghettini with fresh basil, capers, olives and garlic. 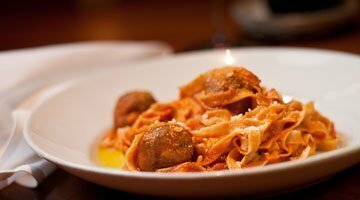 Whether you choose a pasta or seafood, most of the dishes are winners at Eleni’s at $12.00-$15.00 for good-sized portions. Finish with a wonderful glass of Ouzo and a flaky light baklava or Yiaourti Me Meli, Yogurt topped with fresh fruit, toasted almond, warm chocolate sauce and honey. If the food has you falling asleep, perk up with a thick sweet Greek coffee. The wine list can be quite interesting if you have not been exposed to many Greek wines. Far from the days when Greece was primarily known for retsina, there are actually some pretty decent varietals now available. That being said, one hot evening I had a retsina there that blew me away. The wine descriptions are detailed and accurate, markup is very reasonable, and servers tend to be knowledgeable about the offerings to guide you through them. Domestics are available, but I like to take the whole plunge and keep everything authentic. If Eleni’s has a weakness, it is in the service. At times things can move glacially slow. On other occasions, entrees for some people at our table have come out way before others. There is just no excuse for this. Don’t let this keep you away though. Take the plunge, try new taste combinations, and consider it a payment towards your culinary education. Dined here last Saturday with my wife and a friend. The wife and I were married in Greece so we’re a bit biased and always give Eleni’s the benefit of the doubt, but I thought our appetizers (dolmathakia, spankotyropita) were fantastic and they have the best saganaki in town. The kalamarakiaI (calimari) was a bit chewy for my tastes though. My favorite is the Painted Hills beef meatballs (beftekia). We were there at 7pm were well attended to. No complaints about the service whatsoever. The restaurant was moderately busy and was starting to fill up as we left. 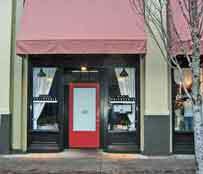 I haven’t been to the Pearl location, but I have been to the Sellwood restaurant and had a wonderful experience. Everything was wonderful, the service, the food, the wine and the ambiance (bustling, but cozy and comfortable). We ordered all vegetarian items, and they were all very delicious. I went with my husband, a couple of our friends and our 2 kids, and we all had a great time. I think this would be a great place for a date, too. Make reservations. They often have a wonderful special (and can make it even if it’s not on the menu). I think it’s called Arne mi filo. Bad Greek aside, it’s a lamb “stew” wrapped in filo with some feta in it. I get it every time. Just wanted to post an update. I have now eaten at the Pearl location, and everything was wonderful (the food, the wine, the service, even the ouzo was great). My husband and I went here with a couple of friends and had a very nice evening. I’ve read some reviews on CitySearch complaining about slow service. Well, I didn’t find the service slow, but then again this isn’t the kind of place to go when you’re in a hurry. Relax, order the flaming cheese, drink a bottle of wine (or two) and enjoy your meal. I agree with FD that the food quality has really gone south here. Had a couple of appetizers here recently – the skordalia was made with old bitter garlic which overwhelmed the taste of a usually great spread. The Feta me filo is different than I remember and just ok. The skewered lamb and chicken – the lamb was good a little tough but the chicken was really meh – no flavor and dry. They have changed their menu and it seems that they don’t offer as many small dishes but that may just be my short memory. Service was good and everyone was very friendly. This is for the Sellwood Eleni’s btw. My boyfriend and I eat at the Pearl location at least twice a month and it’s been nothing but fabulous since our first visit late last year. They recently revamped the menus, the service is great and the food is consistently delicious and authentic. I come from a big Greek family (who have all now recently visited Eleni’s) and love that I can get all the food I grew up with without having to cook. OK, that is a bizarre non sequitur. What “guest”? When, precisely? This is bordering on libelous. Sounds as if you have a vicious axe to grind.